Amazing all-in-one digital microscope takes scientific inquiry to a new level—yet is easy for even a young child to use. Hold the hand-friendly scope over an object, turn the top to focus, then press the single control button to take videos or still image shots at up to 54x magnification with 640x480 VGA resolution. Supports student a the record observations and investigations. Great for lab reports presentations and authentic assessment for digital portfolios. Sharply detailed images enrich whole-class and individual explorations. 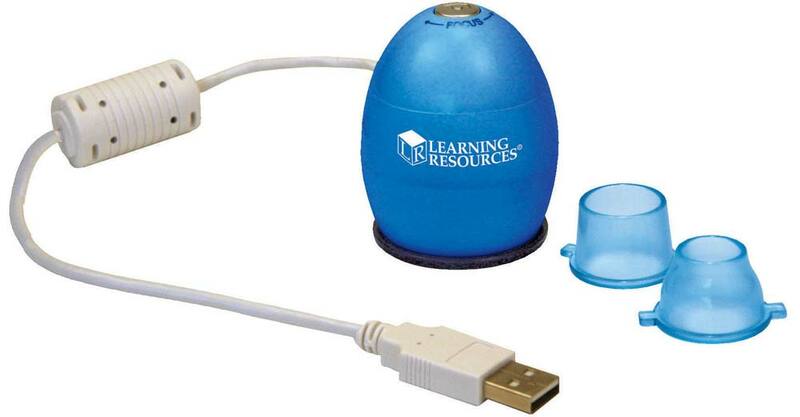 Use with your computer, projector, or interactive whiteboard. Downloads and charges via USB. Features 640x480 pixels, VGA CMOS sensor, 4LED lights, fun special effects (photo frames) and 2 head adapters for viewing different kinds of subjects.